Meat and potatoes, Rick Bayless-style. This easy recipe from Mexican Everyday features deliciously tender… tenderloin… dished up with potatoes and full-flavored, slightly spicy poblano peppers. We don’t cook tons of red meat and aren’t fans of huge slabs of beef, so this was a nice treat. The potatoes took a lot longer than suggested in the book, so I’ve adjusted the times below. By the way, gas ovens are fantastic for roasting peppers. Whoa, what’s this? We never have steak. I know it — I was just in the mood for red meat, and this sounded really good. Well it certainly smells good… how spicy are the peppers? Not very — they’re the poblanos, so they have a nice flavor but aren’t usually very hot. Didn’t you almost kill my mom with some “aren’t usually hot” peppers? Hey, that wasn’t my fault! I blame the produce lady. Besides, I really enjoyed that dish, even if it was way overly spicy. Anyway, back to this dish — these strips aren’t hot! I know, I just finished. Yeah, while you were going on for 20 minutes about pepper excuses, I was enjoying this delicious dinner. I loved the steak. What the — 20 minutes? That was barely 20 words! Whatevs. Like I said, I thought it was delicious. Roast the poblanos over an open flame, turning regularly until blackened and blistered all over, about 5 minutes. Wrap in foil and let sit until cool. Heat the oil in a large skillet over medium-high heat. When hot, sprinkle the beef generously with salt, then put into the hot pan, spreading into a single layer. Cook, stirring frequently, until the meat is almost done — 4 minutes for medium-rare. Remove to a plate. Return the skillet to medium-high heat and add the onion and potatoes. Cook, stirring regularly, until the onion is richly browned, 10 to 12 minutes. Add the garlic and stir for about a minute, until aromatic. Pour in the beer and Worcestershire, sprinkle in 1/4 tsp salt, and lower the heat to medium. Let cook, stirring regularly until most of the liquid has reduced and the potatoes are tender, 10-15 minutes longer. While the mixture is simmering, rub the blackened skin off the poblanos and pull out the stems and seed pods. Cut into 1/4″ strips and add them to the skillet. 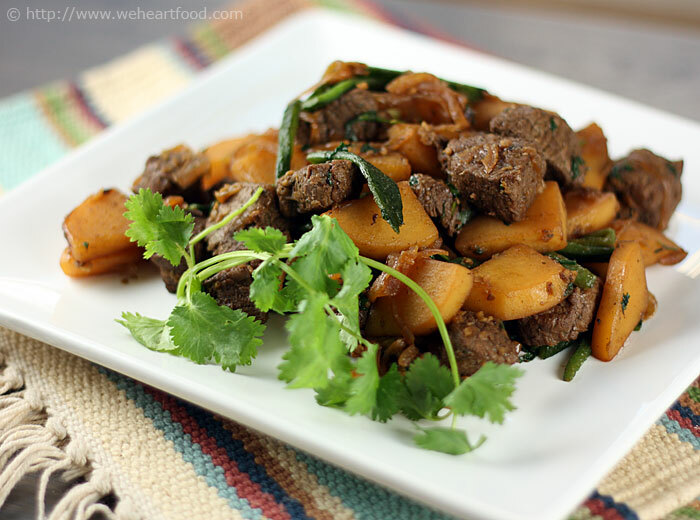 When the potatoes are tender, return the meat to the pan and sprinkle on the cilantro. When the meat has heated through, taste and add salt if necessary. This entry was posted on Friday, June 5th, 2009 at 9:55 pm	and is filed under Mexican Everyday. You can follow any responses to this entry through the RSS 2.0 feed. You can leave a response, or trackback from your own site. With dark beer, sounds like a great dish. Nice plate! I love finding new food blogs that is created by a husband and wife (like us). What a great hobby to share together!! Your poblano beef tips look fabulous!